Oath of Druids is fun in big mana decks. imho if you intend to go to this route and you have no intention of going Mayael, then I would add in Azusa, Lost but Seeking , Rites of Flourishing , Collective Voyage , Veteran Explorer , Hypergenesis , Magus of the Vineyard , Ghirapur Orrery , Reality Scramble , Sunbird's Invocation , Selvala's Stampede , Gate to the AEther , etc. to be able to play a lot of these cards without getting mana screwed since you won't always draw Mayael and have an obscenely high avg cmc. 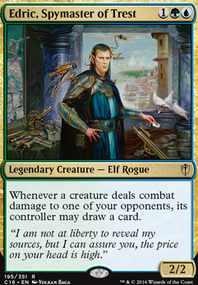 I would look into more cards like Goblin Sharpshooter , Kiki-Jiki, Mirror Breaker , Krenko, Mob Boss , Sylvan Library , Combat Celebrant , Shalai, Voice of Plenty , Selvala, Heart of the Wilds , Angel of Condemnation , Ahn-Crop Champion (and various other exert cards)), Elvish Piper , etc. You could also definitely go for infinite attack phases with Kiki-Jiki, Mirror Breaker + Combat Celebrant , Hellkite Charger + Savage Ventmaw , Godo, Bandit Warlord , Aurelia, the Warleader , etc. Honorable Mentions: Vernal Equinox , Possibility Storm (trade cheaper creatures in for your larger ones), Oath of Druids , Yisan, the Wanderer Bard , Champion of Rhonas , Sword of the Animist , Sword of Feast and Famine , Lifecrafter's Bestiary , Feldon of the Third Path , Heartless Hidetsugu , Stonehewer Giant , etc. Let me know how the list comes along. I don't know about Hibernation's End Luarviq, it is a bit slow, but great if it sticks. In the meta I run it will most likely see up to two counters before getting popped, 5 CMC for a slow investment seems bad imo. My usual rule of the thumb for 5 CMC+ cards is that either it has to win you the game or give you an insurmountable advantage over the opponents. I value a lot of cheap CMC spells over big spells for terms of efficiency and able to play a lot more value. That being said, for budget options there really ain't other ones besides running Defense of the Heart or Oath of Druids . Both are also susceptible to removal. I was intrigued and looked for your list, but I didn't see it on TappedOut. We should compare, at the very least! First, I guess I don't know your meta entirely, but do non-optomized tables not just gun for Sasaya immediately? Like, even just reading what she does kind of sets off some alarm bells, doesn't it? I know everytime I play with somebody new, whenever I get to the "So if I have six Forests out, they all tap for six green" bit, the inevitable response is something akin to "Oh, that's not good." And then if the combo does work, all the more incentive to get targeted next game, or next week, or whenever I play the deck again. That's why I aim for speed above everything else, because if I don't, well, I just get run over. Second, the methods you suggest of becoming more resilient don't really work? Like, yeah, Howling Mine has its uses, but I'd really rather not give my opponents more cards to beat me with, because I'm still the target. It's also why I'm skeptical of Oath of Druids . It's not that I probably won't get free stuff, it's that other people get free stuff first, and when Sasaya's on top of the hill -- a position the deck's going to be in until it's dead -- all that free stuff is headed right at me. I figure you disagree with me about this -- I mean, you did talk about how people want to deal with other people's threats -- but that really hasn't been my experience. Incidentally, these are the reasons I cut utility lands as well. They do have a use. Of course they have a use. But that use is kind of marginal when just playing them makes the deck slower. If they were named "Forest" or "Snow-Covered Forest", we might be talking, but they're not. The only instance I can imagine where that wouldn't be the case is hitting one off of Oracle of Mul Daya , and that seems kind of marginal at best. I've mentioned this before, but sometimes I'm not even sure Scrying Sheets belongs in this deck. 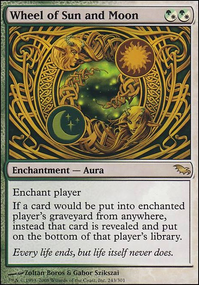 So the consensus as far as I understand it in "real EDH" (read: non-Sasaya) circles is that these cards (Reliquary Tower specifically, though I imagine Spellbook and Library of Leng have similar reasoning (at least Thought Vessel is a mana rock)) are kind of win-more. Like, there is definitely the feel-bad psychological effect of casting a big Blue Sun's Zenith , not finding an outlet for all those cards, and having to discard all the way back down to seven, effectively wasting all that mana, but if you think about it, at the end of the day you're still keeping seven really good cards. 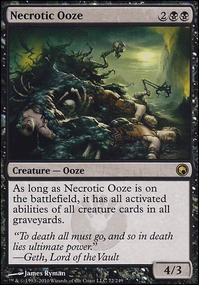 So that plus the fact that the graveyard is much more of a resource in EDH than almost anywhere else, and the "no max hand size" effect starts to lose its luster. But let's talk about Sasaya specifically. As you mentioned, seven lands is a lot of hand space. Under normal circumstances, that means you'll only really have room for one payoff spell, so it better be a good one (put a pin in this idea, we'll come back to it in a bit). But there are alternatives. Last paragraph, I talked about the feel-bad of not getting to keep that big hand, but remember how that big hand happened in the first place: a Blue Sun's Zenith. More specific to my point: an instant. Continuing this thought experiment a little further, let's ask why a player might cast a 7+ card draw spell in the first place. One might imagine that a player casts such a draw spell hoping for an effect that removes their hand limit, but that's not the only possibility. They could also be looking for a specific combo -- a way to end the game. Compare that to Sasaya's instant-speed land searchers (a special shout-out to Yavimaya Elder !). In Sasaya's case, the payoff effect we're looking for is already in the Command Zone. In my opinion, therefore, the deck doesn't need its hand limit removed because there are enough effects that ignore that limitation, and cards like Expedition Map that can find these cards aren't actually that good. But the "why" for that specific claim is a different topic entirely. Let's talk about it! In your post, you mentioned that cards like Cultivate , Kodama's Reach , and Peregrination were all "ideal ramp spells" for a Sasaya player, as they also added a land to the hand, therefore ending up card-positive. Now, I already dismissed Peregrination out of hand for being too slow, but it's important to include it here as well because I feel it has the same other trappings that might encourage a Sasaya player to play these cards. 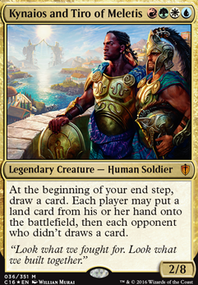 In short, I posit that these cards are, in fact, card-neutral at best. This applies to Renegade Map et al. as well, but I'm just going to focus on the sorceries just for simplicity's sake. Let's examine a typical goldfish turn. First, the draw step. Obviously, they're at plus one card. Then, the goldfish plays a land, removing a card, then playing a non-land, which is minus another. If that non-land is a Cultivate effect, that only adds one card back, which leaves the goldfish more or less where they started. Because ramp becomes negligible once Sasaya flips (while there is certainly a difference between, say, eightteen starting mana and twenty-eight, I find it's not enough to worry about, and the difference between twenty-eight and forty is even less), that means the goldfish is spending three mana on nothing much at all (as a sidenote, you might notice Nissa's Pilgrimage and Evolution Charm in the deck, which seem to contradict this point. However, both of these cards have occasional upside potential. It doesn't always happen (and, in Pilgrimage's case, certainly never on Turn 3), but circumstances for it do exist, so they keep their slots). 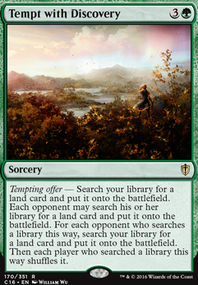 The solution some Sasaya players offer is to stop making land drops, but that seems so tempo-negative to me. I feel that, if I do continue making land-drops, eventually I'll be able to cast these giant threats without the help of Sasaya, and could easily win the game that way. Lastly, before I get into specific cards, I wanted to talk about the ramp spells I do play. Namely Azusa, Lost but Seeking and similar effects. I already mentioned the speed aspect of my build, and these cards are a part of that. To be more specific, these cards are in the deck to turn cards like Chord of Calling and Citanul Flute into more ramp if necessary, which, when you're going for a Sasaya flip and a kill in the same turn, is worth having in the toolbox. 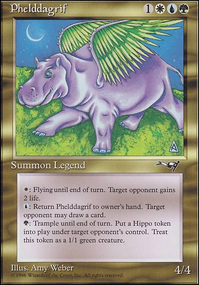 But these cards also function as pseudo-alternate win-conditions. As I alluded to just a paragraph above, the only difference between tapping ten lands for a Kozilek, Butcher of Truth and tapping one or two is how smug the caster gets to feel. But the caster still gets an eldrazi in either method, so I don't think the difference in smugness is very big. City of Solitude : The biggest strike against this card is that it's not easily tutorable and Dosan the Falling Leaf is. Also, I don't think I need two of this effect, to be honest. Summer Bloom : I've tried it. The problem is, because it's a one-shot effect, it's way too dead pre-flip. Azusa and her kin are both tutorable and stick around, so they're just better. Skyship Weatherlight : This and Book of Rass are my two favorite suggestions, and I definitely want to try playing around with them on paper instead of just theorycrafting. If there's anything you take from this too-long screed, I want to thank you for bringing these cards to my attention. Goblin Cannon : This was suggested before and I didn't really dismiss it off-hand, though I did ask "What do I cut?" I didn't have a good answer, then, though maybe it's -1 Akroma's Memorial , Hydra Broodmaster , and Kamahl, Fist of Krosa for +1 Goblin Cannon , Book of Rass , and Skyship Weatherlight ? I'm still hesitant because Kamahl at least is fine pre-flip (Broodmaster is bad yes, but not terrible. At least, I think there's a difference there), not to mention in my meta, effects like Crawlspace and Ensnaring Bridge are less popular than Leyline of Sanctity or even Aegis of the Gods . I guess there I'll have to test and see. You're right, by the way, about Akroma's Memorial being pretty dead 99% of the time, but it's the best haste outlet, and specific kill's been good enough for me. 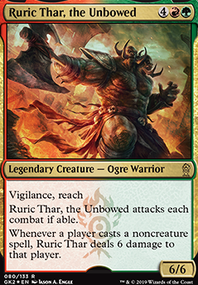 If I didn't mention a card here, it's because it obviously is different from either my strategy as I've listed in various places, or is implicitly against the deckbuilding philosophy of my particular list. Or maybe I missed it, and you can bring it up if/when you respond. In any case, thanks for the comment, and keep fighting the mono-green combo fight! I personally feel as if the deck is too dependent on the opponent's strategy to win: it only looks good if the opponent is playing creatures. 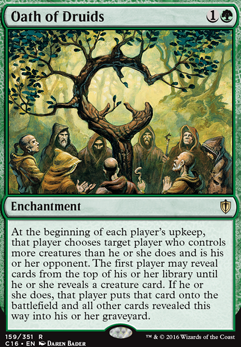 Most decks that rely on these strategies use internal mechanics to manipulate their opponents' boards (such as Forbidden Orchard and Oath of Druids ). The deck will be amazing against creature decks without shroud but is unfavorable against most other matchups as you would end up with a handful of spells with no targets. Instead of focusing so hard on creature removal I'd add in more versatile cards like Collective Brutality . You could consider Consuming Vapors , Abyssal Persecutor , and Hunted Horror . Sacrifice decks often go nicely with a dab of suicide.